We realize you have choices when researching chiropractors in San Clemente, this is why we volunteer information so you know what you can expect in our office. New patients often remark how “homey” our office is. That’s good, because our goal is to offer state-of-the-art chiropractic care in a comfortable surrounding. We work very hard to create a fun, loving environment for our patients. So, make yourself at home! You’ll find plenty of convenient parking and a well-lit parking lot. Upon arrival at Swift Health Chiropractic in San Clemente you will be greeted with a smile and asked to sign in. The front desk assistant will introduce herself and give you any needed paperwork. While completing your paperwork, please help yourself to a cup of tea or an apple. Once your paperwork is complete you will be shown a short video before your consultation with Dr. Swift. San Clemente Chiropractor, Dr. Tim Swift will spend time with you to learn about your health history. Following the consultation, he will perform a thorough exam to find out where your problem is stemming from. 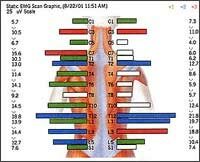 Once the exam is concluded, we make an appointment to review the findings and start chiropractic care. An important part of your first visit is the technology we use to measure the condition of your nervous system. It’s a noninvasive procedure called surface EMG. Nervous system compromise causes muscles along the spine to exhibit unusual electrical activity. Our equipment can detect differences as small as a millionth of a volt. After gowning, we’ll have you sit still for a moment or two. Then, starting at the base of your skull, we’ll run two probes down your back. Think of these as radio antennas listening for a distant station. That’s it. The computer does the rest! You’ll see the computerized printout and learn what it means. Because your care is based on the condition of your nervous system, not how you feel, this technology is one of the focal points of our practice. We recommend you bring comfortable, loose fitting clothing, and any imaging that you would like to discuss with Dr. Swift. We also encourage you to bring any other family members that want to be checked by the chiropractor. Please give yourself an hour for your first visit. If you have been to see other chiropractors in San Clemente without results — give our office a call! We’ve helped many San Clemente, Dana Point, San Juan Capistrano families who went from chiropractor to chiropractor and finally found results in our office.